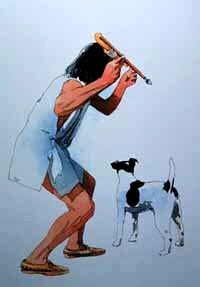 This Andy Buttram illustration shows an Archaic Period hunter poised to launch a spear with an atlatl. Image taken from Illinois State Museum exhibitions at Dickson Mounds Museum. We look at body sizes, animal behavior, historic accounts and oral histories of American Indians, and stone tools and other artifacts to analyze how animals were likely hunted. 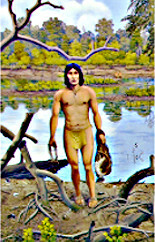 During most of the Archaic Period, hunters speared large animals such as white-tailed deer with the aid of the atlatl (spear thrower). We find numerous spear points made from chipped stone and antler. We occasionally find hooks or weights for atlatls. The hook holds the spear in place, and a weight was often attached to the atl atl to increase the thrust. The spear thrower allows a hunter to thrust with more force than is possible with a hand-held spear. Archaic Period hunters also likely used darts to take animals of many sizes. We find smaller points that may have been tips for darts. Some archaeologists think that the bow and arrow made its appearance in Illinois during the Late Archaic Period. However, we don’t find any definite arrow points at the Modoc or Koster sites or any of the Late Archaic sites in the study area for our grant. This illustration by artist George Armstrong shows use of a throw net to capture waterfowl. Courtesy Center for American Archeology. Throughout the Archaic Period, people likely trapped medium and small-sized animals using snares and deadfalls. They may have used throw nets to capture animals such as waterfowl and cottontails. We occasionally find fabric impressions on sediment and fragments of cordage and fabrics on copper artifacts. Some archaeologists think that plummets recovered at Late Archaic sites may represent weights for throw nets. Some archaeologists propose that they are bola stones similar to the ones used in South America. Others think they represent charms used in hunting or for other ritual or ceremonial purposes. Archaic Period fishermen used nets to catch fish. They baited bipointed gorges and fish hooks in some areas. They probably also took large fish with spears. Fishing technology likely also included traps, baskets, weirs, and use of plant-based poisons to stun fish. 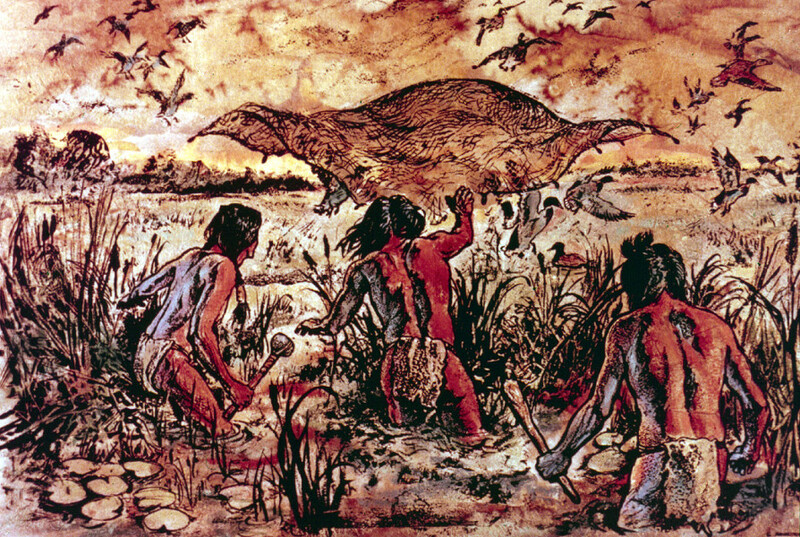 Museum artist Robert G. Larson painted this scene for the Late Archaic diorama in the Peoples of the Past exhibition at the Illinois State Museum. The small body sizes of most fish from Archaic Period camps at Modoc and Koster suggest collection with non-selective techniques such as nets, traps, and weirs. Drs. Paul Parmalee and Bonnie Styles have both commented on the small body size of the fish in the Archaic Period deposits at Modoc Rock Shelter. Zooarchaeologists in the 1980s recorded the estimated standard fish lengths for the fish remains recovered at Modoc Rock Shelter. We included these data in our tDAR databases. We and future researchers will now be able to quantify the lengths of fish recovered at these sites. The kinds, sizes, and habits of fish species present at archaeological sites provide clues to how Archaic Period fisherman caught them. Buffalo fish (Ictiobus sp.) and bass (Micropterus sp. ), dominated the small sample of fish remains from the late Early Archaic deposits of the Main Shelter at Modoc Rock Shelter. Buffalo fish are most abundant in rivers and large tributaries, but they do come into deeper sections of lakes. Biologist William Pflieger notes that buffalo fish are rarely taken with a hook and line, and today are more often taken with trammel nets (with multiple layers of mesh). 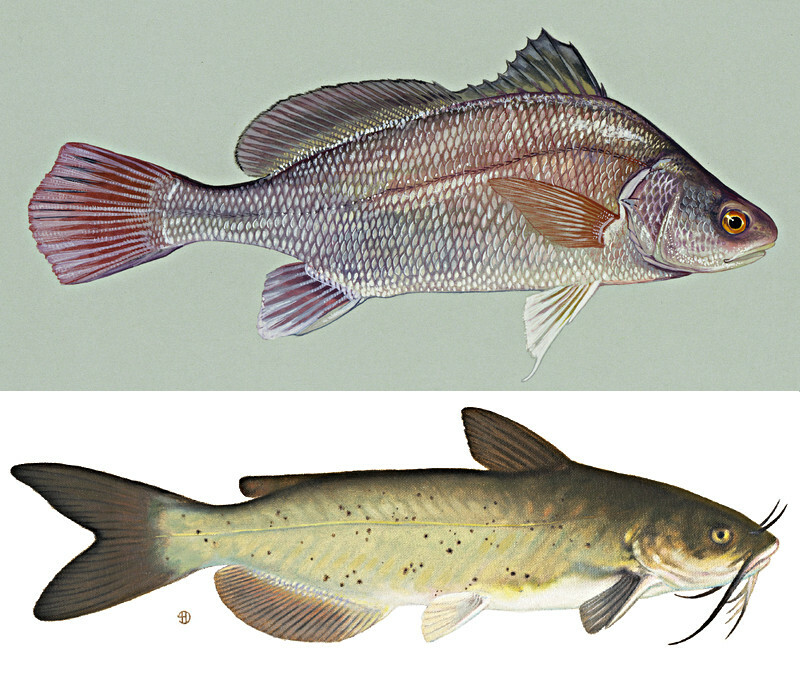 Buffalo fish, bowfin (Amia calva), bullheads (Ameiurus sp. ), and bass dominate in the early Middle Archaic deposits in the Modoc Main Shelter. Bowfin inhabit clear, well-vegetated quiet waters in lakes and rivers. We have suggested that the increases in bowfin and bullheads indicate that the oxbow lakes were present in the floodplain in the early Middle Archaic. Many of the bullheads are very small. We think Middle Archaic fishermen may have taken bowfin and bullheads in the oxbows with nets. During the middle Middle Archaic, the same species continue to dominate (buffalo fish, bass, bullheads, and bowfin). During the late Middle Archaic, gar (Lepisosteus spp. ), bullheads, buffalo fish, and bowfin are most common. Gar often inhabit the quiet waters of oxbow lakes and come to the surface to feed. Today they are taken by bowhunters. They may have been speared in the past or taken in nets. The early Late Archaic fish assemblage primarily includes buffalo fish, bullheads, gar, and bowfin. Numerous species are present in all of the fish assemblages at Modoc, but the same species tend to dominate over a long time period (from the early Middle Archaic through the Late Archaic). Did Archaic Period hunters seek out particular species or did their fishing techniques yield these species? We have not found net fragments in Archaic Period sites in Illinois, but we do find impressions of fabrics in hardened sediments and bits of fabric preserved on copper artifacts. Archaeologists recovered grooved pebbles that likely served as net weights at the Late Archaic Robeson Hills site, near the Riverton site in eastern Illinois. Dr. Howard Winters reports that the similar sinkers were recovered at the Carlston Annis site, one of our study sites in Kentucky. The Kramer site in the Ohio River Drainage of Southern Indiana yielded three pebbles that may represent net sinkers. Archaic Period people likely harvested shallow lakes with nets, perhaps using drives and poisons. We recover small bipointed bone implements (called gorges) at Archaic Period sites in Illinois. Archaeologists recovered single gorges in Late Archaic deposits at the Robeson Hills and Swan Island sites. Fishermen would have fastened gorges to a line and covered them with bait. Archaeologists did not recover fish hooks in Archaic deposits at Modoc. They only recovered one fish hook in Archaic deposits at Koster. However, archaeologists recovered bone fish hooks in Middle Archaic deposits at the Black Earth site in southern Illinois. Historic accounts provide evidence for use of all of these fishing techniques. The freshwater drum (Aplodinotus grunniens) (top) lives in large streams and feeds on fish, crayfish, immature aquatic insects, and mollusks on the bottom. Adult channel catfish (Ictalurus punctatus) tend to occur in large streams. During the day they stay in deep water or under logs. They move into shallow water to feed at night and consume fish, crayfish, aquatic insects, mollusks, and plant material on the bottom. Contemporary fishermen primarily catch drum and catfish with baited hooks on the bottom. Images taken from Wikimedia Commons. Our grant project documented cultural differences in the kinds of fish taken and how they were likely captured across our study area. Drs. Tanya Peres, Renee Walker, and George Crothers of our research team compared the frequency of fish likely caught with hook and line to those likely caught with a net. Deep water, bottom-feeding fish are more easily caught with a hook and line. Fish that congregate and feed in shallow water are often caught with mass capture techniques such as nets. Drs. Peres, Walker, and Crothers quantified the proportion of fish that feed on the bottom in deep water in the Ohio River Drainage and Mid-south sites. The Green River sites in the Ohio River Drainage of Kentucky showed the highest proportions of the deep water, bottom feeding fish such as freshwater drum and river catfish. Fish hooks were also more common at the Green River sites. The sites in the Mid-south either had few fish remains (Cumberland drainage in Tennessee) or fish assemblages that appear to represent group capture. For example, small to medium-size suckers dominated the fish assemblage from the Dust Cave site in Alabama. These fish were likely taken with nets or some other group capture technique during spring spawning. We are doing similar analyses for all of our sites. Across our study area, Archaic Period Indians likely collected terrestrial turtles by hand or by digging them out of the sediments in winter. Aquatic turtles were also likely caught in nets while fishing. Dr. Beverley Smith of our research team found that the late Middle Archaic Period people at the Bear Creek site in the Great Lakes area of Michigan collected more aquatic turtles than was the case for our other sites. This detail from the Late Archaic diorama in the Illinois State Museum's Peoples of the Past exhibition shows women collecting mussels along riffles in the Wabash River in eastern Illinois. Archaic Period people likely used their toes to locate the mussels and then picked them up with their hands. Museum artist Robert G. Larson painted the background for this diorama. Archaic Period people likely collected freshwater mussels by wading in streams and rivers and collecting the mussels by hand. Historic accounts document the great productivity of the Illinois River mussel beds. The inhabitants of the Koster site in the Illinois River valley made greater use of freshwater mussels than the inhabitants of Modoc Rock Shelter in the middle Mississippi River valley. Does greater use of mussels reflect greater productivity, differences in cultural traditions, or both? Freshwater mussels are very abundant at Koster and the Ohio River Drainage sites (Riverton and the Green River Shell Middens) in our study area. They are less abundant in our Great Lakes and Mid-South sites. These freshwater gastropods (snails) were excavated from Modoc West Shelter in 1956. In 1993, zooarchaeologist Jim Theler analyzed gastropods from the 1956 excavations. He argued that the larger snails were eaten because some have spires that were snapped off and some have holes in the shell wall. Image taken by Bonnie Styles. Archaic Period people also collected freshwater gastropods by wading and hand collection. The small sizes of some aquatic gastropods suggest that they may have been scooped up rather than collected individually. Middle Archaic camps in the West Shelter at Modoc Rock Shelter had numerous freshwater gastropods. Aquatic gastropods are extremely abundant and dominate the faunal remains at Middle Archaic sites in the Cumberland River drainage of Tennessee. Dr. Tanya Peres, a member of our research team, and her colleagues have argued that Middle Archaic people in this region may have practiced a form of aquaculture. They may have tended the gastropod beds to ensure their productivity. We only get a bare bones picture (pun intended!) of hunting and collecting techniques during the Archaic Period. Based on studies of historic and modern hunters and gatherers, men, women, and children would have all participated in the hunting and collecting of animals. Understanding resource availability is important, because you cannot hunt or collect something that isn’t there. However, there is no question that choice and tradition played a role in what was collected. Groups didn’t collect all the animals that were available. We find evidence across the study area for our grant for regional differences that cannot be explained solely on the basis of differences in the availability of animals.